MICHIGAN STATE (US) — By the end of the century, warmer oceans may mean phytoplankton populations will shrink in equatorial waters and thrive near the poles, a shift that could significantly impact climate change. Because the tiny organisms play such a key role in the global food chain and the world’s cycles of carbon, nitrogen, phosphorous, and other elements, such a drastic drop could have measurable consequences, researchers say. “In the tropical oceans, we are predicting a 40 percent drop in potential diversity,” says Mridul Thomas, a graduate student at Michigan State University and a co-author of a new study published in Science Express. Phytoplankton use light, carbon dioxide, and nutrients to grow. Although they are small, they flourish in every ocean, consuming as much carbon dioxide through photosynthesis as all the terrestrial plants combined. Water temperatures strongly influence their growth rates. 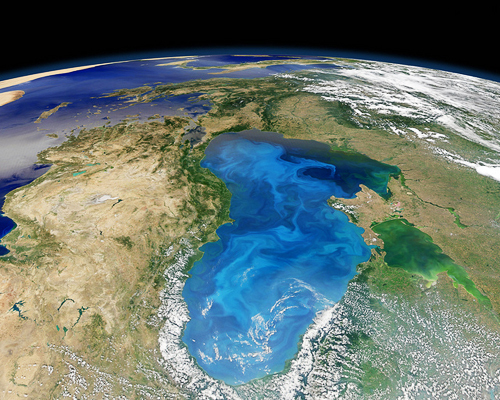 In fact, phytoplankton in warmer equatorial waters can grow much faster than their cold-water cousins. With worldwide temperatures predicted to increase over the next century, it’s important to gauge phytoplankton’s reaction and what will happen to the carbon that they currently carry to the ocean floor. Phytoplankton have so far adapted fairly well to local current temperatures, but based on projections of future ocean temperatures, they may not be able to do so quickly enough to changes in their current environment. Since phytoplankton can’t regulate their temperatures or migrate, they may suffer significantly limited growth and diversity, says co-author Colin Kremer, a graduate student in plant biology. The National Science Foundation and Michigan State University’s Beacon Center for the Study of Evolution in Action supported the work.